Le-Ax Water District are marking locations with Esri Collector’s beta 10.4 and Eos Positioning Systems’ Arrow 100 GNSS to 8cm! Collector for ArcGIS is adding exciting new capabilities to the next release that let you map your asset data (hydrant, meters, valves, pipes, signs, and more) with a precise spatial location. Travis Anderson, an engineer with Le-Ax Water District in Ohio, is taking advantage of our very active beta program to get a head start on marking assets this summer. Le-Ax was formed in 1968 to provide safe drinking water to the Village of Albany and 250 families in the surrounding area. Le-Ax has 15 employees, maintains 400 miles of waterline, serves the Village of Albany, and 6,950 customers in 17 townships in 4 counties. When Travis started as a district engineer in the fall of 2009, equipped their maintenance crew with rugged handhelds and sent them out to mark locations. The crew struggled with the devices where in some instances Travis said “they would be ready to backfill a trench after a repair and would be waiting for minutes to get an accuracy level to take a point.” This left a negative impression of GIS within the district. Travis is self-taught when it comes to GIS and it’s a small part of what he does within the Water District. However, what really changed everyone’s attitudes toward GIS was the use smart devices. With their iPads, they starting creating a photo inventory of valves but knew they could do much more. Travis said, “When Collector came out it was a no-brainer for me.” They could email staff in the field, retrieve information, take pictures, etc. The iPads just had so much more capabilities than the traditional GPS handhelds. 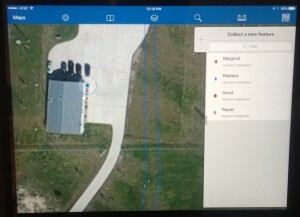 Once Collector had the ability to take maps offline, it became a matter of just getting an accurate external GPS receiver to work with the iPad.